April Botanical shows the flowers of April, based on the work of Robert Furber. An English botanist, Furber published his famous work called Twelve Months of Flowers in 1730, where each month of the year was depicted. Each month showed the flowers in season. Here in April in mid spring, we see an abundance of tulips in a variety of colors such as yellow, red and purple. There are other flower types and foliage in the vase also, which itself is classic in style. An emblem labeling the work as April is seen, as are a list of flower species names. 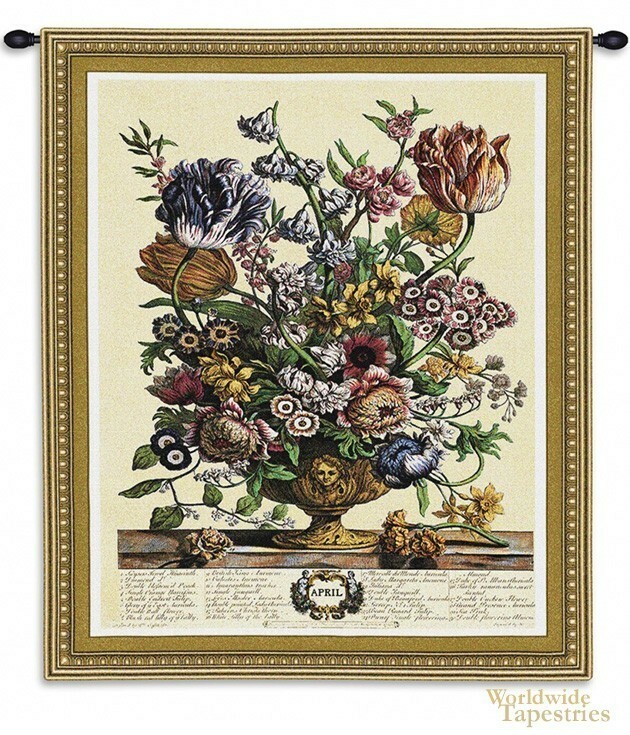 April Botanical tapestry has a lining and a rod tunnel for easy hanging. Note: Tapestry rod and tassels, where pictured, are not included in the price.